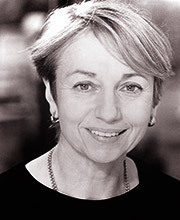 Kate Binchy ’s theatre work includes The Seagull, Flan O’Brien’s Hard Life and The Steward of Christendom. She has appeared regularly on television in programmes such as Peak Practice, Casualty, Trial and Retribution, The Chief and Bernard Shaw Documentary. Her film credits include The Lonely Passion of Judith Hearne for Handmade Films and The Eagle Has Landed.